Below is an article by John Briere, salvaged from the Quake Literary Guild, a now defunct fan fiction repository for Quake. Computer games are one of the newest forms of entertainment available today. As computers have become more and more prevalent in our society, computer based entertainment has also become more popular. The first wave of this form of entertainment came in the late Seventies and early Eighties with the coin operated video game. Pac-man and Space Invaders both entered the mainstream of everyday experience, at least for me as a young boy at that time. Suddenly on every corner in my home town there was an video game arcade, full of flashing lights and tinny beeps. As a time waster and money drain, these places were very popular. I remember putting myself on a strict limit of how much I could spend a week at the arcade. Maybe someone would argue this with me, but none of the games from those days function at any kind of artistic level. There is certainly a skill involved in producing an exciting game, one that demands to be played and replayed. Although elements of the game (graphics, sound) can have an individual aesthetic value, the experience as a whole is mostly an exciting test of reflexes and attention to details. Still, anyone who played those games can testify that the initial experience was very powerful, engrossing. Soon after, my family got a home computer, and I had my first experience with games designed just for the computer. At that time the computer could not compete with the arcade machine in colorful graphics, loud sound and special controls like the joystick. The computer was also freed from the need to constantly eat quarters, and so the whole feeling of an early computer game was different. Many games were text based, with the emphasis placed on puzzle solving and interaction with a ‘virtual’ environment created in the players mind by words on the screen. Although games such as ‘Zork’ never gained the cultural prominence of glitzy arcade games with adolescent appeal, within the computer-using subculture, these early games were well known. There have been some who have argued that these games have a strong aesthetic or artistic value to them, by their use of prose to create mood and setting. However, I feel that most of these games fell well short of that mark, due to their brevity and simplicity when compared to novels. The fatal flaw is the inability of computers to ‘play’ a character with any sort of depth. Within a novel, the reader can experience several characters who can surprise and engage, who seem to live in some way. In the early computer games, any ‘living’ character was confined to a few canned response to special situations. They became another piece of the general puzzle. Puzzle solving is a lot of fun, though, and these games had their own special addictive quality. You had to really think to solve some of the puzzles, often with creativity and humor. Since that time, the technology has changed, but most of the games have not. You can play computer games at the arcades, on console systems that hook up to your television, or on your home computer. The industry is huge, advertises on television, and even has a rudimentary ratings system. There are dozens of genres, but when I take a look at all the games, I see two threads or themes that repeat and entwine together. The two tensions I see are between the ‘arcade’ style of game, and the ‘puzzle’ style of game. Some games place almost all of their emphasis on the ‘twitch’ reflex, some place almost all their emphasis on deep thinking. Most fall somewhere in-between. As I am now a computer science major, I can now see that these two themes grow directly out of the underlying technology of the computer. The computer can do two things very well: it will make very fast computations, and it will store and retrieve large amounts of information. One thing makes a great twitch game, the other helps to create a great puzzle game. Of course a lot of human creativity, hard work and luck is needed to make a truly classic game, one that will draw you in and make you feel that you cannot stop playing it, but the basic game play in most games is usually works with these two computer strengths. One of the most enduring and popular computer game genres, the flight simulator, is a classic case of a perfect mix of twitch and puzzle. You might not see how flying a virtual plane around semi-realistic scenery is part puzzle, but games like these, which you could call ‘skill’ games, involve gaining knowledge and experience controlling a realistically modeled physical phenomenon. Playing these games well can’t be done using only the twitch reflex. A certain amount of deep thinking, exploring and discovering is also necessary. Well done games of skill have an inherent appeal to me, an attraction. I enjoy the way that all my senses are engaged, and the feeling of accomplishment when I learn a new way to do something, or I do something especially well. But even these games will become boring and old after a while. The truth is that even the most advanced computer game has a limited playing lifetime. This might be changing. A new type of computer game has arrived, the best example of which is the subject of this paper, Quake. I will argue that Quake is not even a ‘computer’ game at all, (although we perceive it as such) but something new, based on a different technology. But first, I think we need to talk about non-computer games. Computer based games are just over 20 years old. Far more popular and older are non-computer games, such as cards, chess, baseball and soccer. What makes these activities ‘games’ and what is their aesthetic value? Although a full discussion of these topics is too much for a small paper like this, I will attempt to lay some groundwork for thought. We often see animals, especially young animals, engaged in something we perceive as play. Animal behaviorists will argue that the activity is simply an instinctive practicing and learning of skills that will be necessary for later survival. In social animals play among the young also creates or reinforces dominance hierarchy. The same could easily be said about human children. It makes sense to look at the play of human beings and try to figure out what it is they are learning and practicing. For young children, play is some combination of exercise, dexterity and imagination that may or may not be a game. However, especially as children get older, playing means playing games. What is a game? At its most basic, a game is two things: rules and a goal. If you follow the rules and achieve the goal, you win. If you break the rules, you are a cheater; if you fail to achieve the goal, you lose. You can play a game by yourself, but we shall neglect this for the moment and focus on games you play against an opponent who must follow the same rules as you and achieve the same or a similar goal. Sometimes a team of people play against an opposing team. In this case a new element is added to the game, cooperation and planing between team members. What do human beings learn from games? Well, we learn that there are rules; we also learn how to follow the rules. We learn that achievement of goals is good; we also learn how to deal with failure. In team games we learn how to cooperate and communicate with teammates. All of these skills are useful and even necessary in modern society. Games are an important aspect of human socialization. But why do we continue playing games as adults? What is the aesthetic value, the inherent appeal, of playing games? As adults, the game is an escape, a return to a place where the rules and the goals are known and fixed. Observing and playing games can be both relaxing and exciting, a way to engage and interact with others using basic, abstract relationships, something without the weight or pressure of ‘real’ life. The athleticism and power of sports can be beautiful in itself. I suppose most people wouldn’t call sports an art form, but can we deny that a great game of basketball or an intense Olympic event has as much drama as any movie or play? People who study chess make many distinctions between styles of play, assigning aesthetic value to some styles or moves. Is a game of cards a form of art? Certainly it is hard to deny that a game of cards can have an emotional impact, the thrill of victory, the agony of defeat. Each game of cards is unique, and full of tension or pathos, depending on your state of mind. As an experience, a game of cards is not always something mundane. It is the formal way we interact during a game, according to specific, well constructed rules, that makes a game great and creates its aesthetic value. It is as much an act of communication, between opponents or teammates, as anything else. Earlier I mentioned that you could play a game by yourself. In most traditional solitary games you play against random chance, as in the card game solitaire. Although we think of it as a game, it is more like a puzzle or challenge of your memory and observation. Winning at solitaire has always left me feeling more amazed at my luck than victorious. This brings us to computer games. Is it surprising that one of the most ubiquitous computer games around is solitaire? All computer games are played against yourself. The trick of the computer is to give you the illusion that you are engaged in something deeper than a fancy game of solitaire. It does this, as I said before, by using two of its strengths: very fast calculations, or a lot of stored information. A computer game can be a lot of fun, an exciting experience, but the inherent appeal, the aesthetic value is lessened by the fact that they are so solitary, and in the end you just can’t play a computer game as many times as you can play a fun game of card with some friends. Quake is the computer game that is at the forefront of a new type of gaming that is emerging in the mid-Nineties. Quake is grouped with several other games under the banner of multi-player or network games, but I will try to show how it is the best example of this genre, and what I feel to be the aesthetic value of Quake. The initial impression of Quake is that it belongs to the well established genre of the first person shooter. The first person shooter was popularized by Quake’s immediate ancestor, Doom. Both games consists of running through hallways and rooms shooting or attacking enemies with a variety of weapons. The scenery is detailed, the action fast, furious, violent and often gory. Everything is viewed from a first person perspective, as if you were physically there. The graphics ‘engine’ that runs Quake is probably the most advanced available today. The architecture of the virtual worlds is extremely complex, with realistic and dramatic lighting. The enemies in Doom were two-dimensional ‘sprites’ that simulated the third dimension. By contrast, the inhabitants of Quake are fully three dimensional, allowing you to view them from above or below as well as directly in front. All of this contribute to its definite success at the most basic appeal of the first person shooter, it’s ability to fool the mind, to give you the feeling that you really are there. But as a simple first person shooter, Quake is little more than a demonstration of some great graphics technology. The plot is almost non-existent, just a basic excuse to run around and shoot things, blow things up. To tell the truth, playing plain vanilla Quake isn’t much of a revelation. Sure, the graphics are great, but great graphics doesn’t make a great game. So why am I making such a big deal out of it? Lets look at Quake through the lens of the Paul Levinson essay “Toy, Mirror, and Art: The Metamorphosis of Technological Culture “. In this essay, Levinson makes the case that there are 3 stages in the road of a new technology from obscurity to popular culture. The first stage, ‘Toy’, is the exploitation of the new technology for novelty alone. Most of the people working with the infant technology are hobbyists who are more interested in showing off the abilities of the technology than what its actual aesthetic value is. As examples, Levinson points to the early work in film and radio. The early stages of both media were dominated by amateurs who created content mostly for themselves and other amateurs. The second stage, ‘Mirror’, comes when creators use the technology to produce content that is not simply a ‘special effect’ of the technology. The content is instead a reflection or transmission of reality. This stage is exemplified by the way that, as we experience the content, we forget the technology used to produce the content. If your entire focus is on how new or different the technology is, you won’t be able to experience it’s ability to reflect reality. As Levinson says, “The public’s willingness to respond […] to a photochemical likeness of a face as if it were a real face [allows] technology to […] substitute for the real world. ” It seems to me that for a technology to achieve this stage in it’s evolution, it must be widespread and fairly inexpensive to participate in. It is this accessibility that that allows it to be accepted as a normal part of life and not a trick or gadget. The third stage is the point where the technology is used to create a wholly new experience. The creators or artists use the accepted ability of the technology to reflect reality to create a new, unique reality. It is interesting to note, as Levinson does, that at this stage, the content is often based on the content of previous art forms. “Plays and books, for example, become the content of the new medium, film, and film becomes, in turn, the content of the newer medium, television. ” At this stage, the use of the technology may or may not be accepted as an art form in it’s own right, but it is definitely being used to create vibrant, emotionally satisfying experiences. We shall call this stage ‘Art’. I want to show how I think Quake is existing in all three categories at once, to a greater or lesser degree. As a computer game, you might think that it is obvious how Quake is a toy. But how is it a toy in the way that way that Levinson uses the word? What is the technology Quake is exploiting for novelty? Can there be Quake hobbyists? In fact, there can, because Quake is completely programmable and expandable by the end user. This is one of the two revolutionary qualities of Quake, and the reason I think of it as a technology more than just a game. It is not simple customization, as though you could change the color of your character (although you can do that), but an open set of tools that you can use to change every aspect of the game. Quake, the rather simple first person shooter, is the toy that exploits Quake, the technology that creates a believable world on your computer screen. The things your character can do, it’s ability to interact with the virtual world, and the actions of the ‘enemy’ characters are completely controlled by QuakeC, a simple computer language. The creators of Quake have released the QuakeC compiler that they used to create the game itself. Now anyone with a certain amount of computer skills can create their own ‘patches’ or ‘mods’ to change or enhance the game. In the few months since the game has been released, hundreds of patches have been released by hobbyists all over the world. The set of hallways and rooms through which your character moves is called a ‘map’. Currently there are about a dozen different shareware programs available that let you create your own maps. The creators of Quake have released their own tools to the public that allow you to ‘compile’ a map into the beautifully textured and lit world you see on your screen as you play. Right now there are several amateur projects called ‘Total Conversions’ (TCs) that are attempting to change every aspect of the game. In effect, these are completely new games that use the existing Quake technology. Some are different versions of the first person shooter. But others actually expand or change our understanding of what a first person shooter is. Some take their inspiration from popular movies, some from other popular computer games, some from imagination. This is Quake in its toy state. Each TC is an attempt by its creator to exploit this new technology for novelty, it’s intended audience being mostly other hobbyists. The second revolutionary quality of Quake is what makes it, in some ways, act as a mirror for reality. More than one person at a time can play in the same game of Quake. What’s more, you can play Quake over the Internet with people in widely separated areas. Why is this so special? What makes this a mirror? There have been other multi-player games before Quake. Multi-User Dungeons (MUDs) have been a popular subculture on the Internet for some time. These are basically the combination of text adventures from the ancient past of computer games with chat rooms. Many people can play, but the interaction is entirely through text. Doom, the ancestor of Quake, was the first game that popularized graphical multi-player gaming, but the only way to play multi-player Doom was over expensive Local Area Networks. Most people didn’t own or have access to a LAN. Multi-player Quake is available to anyone who has a connection to the Internet. Quake is the first game to combine the open access of the Internet with the graphical flash and adrenaline rush of first person games. There is something very different about playing a game against real people rather than computer controlled opponents. I touched on this in my earlier section on non-computer games. The whole experience and feeling is different. The feeling of triumph is more pure, the emotional satisfaction greater when you ‘kill’ a human opponent. The aesthetic value of a playing a game of Quake against other humans is much closer, for me, to a game of tag than to any other computer game. When you combine this aesthetic quality with the amazingly real look of Quake, the end result is a very strong feeling of ‘being there’ that allows you to forget that you are using a computer to play a game. In this way, the technology behind Quake disappears, and you are left with a mirror of reality. There have been a few interesting consequences of this new way of gaming. In the few months since Quake was released, a subculture of Quake players have come into existence called Quake Clans. These are small teams of Quake players that challenge and battle each other on various Quake servers. Clan members may or may not ever meet face to face – all communication and planning is over the Internet. There are even leagues and playoffs between the many clans. Some total conversions are designed with this team play aspect in mind. One of the most popular modifications of Quake right now is Capture the Flag. Special maps, graphics and rules have all been used to change the game from a hunt and kill style to a true team game, with strategy and cooperation being necessary to win. Quake is the first truly accessible ‘virtual reality’, a place where you can interact with other human beings in convincing physical space, with your eyes, ears and mind all engaged. As I have said before, Quake is also mindless, utterly violent eyeball candy with almost no plot. Can it be art? The technology of Quake is completely open to its users. With the success of the Capture The Flag modification, Quake Soccer and Quake Football are both in development right now. It is no stretch to say that the aesthetic value of Quake has something similar to the aesthetic value of any game in the ‘real world’ where you match wits and skill against another human being. But Quake has something else – the ability to refashion it’s reality in almost any way. The architecture of the maps can be totally realistic or completely fanciful. The physics can be altered or changed according to your imagination. In it’s own way, Quake is an entirely new medium. Obviously, with the game itself being only a few months old, there hasn’t been the kind of mature, confident exploration of possibilities you would expect from an older technology. But already, in one area, Quake is showing that it has the potential to provide an artistic experience. The architecture of the amateur or hobbyist maps is becoming steadily more complex and exciting. I have seen pictures of a highly detailed Gothic cathedral, complete with beautiful stained glass windows. Could it be that in a few years a generation of architects and interior designer will have learned their first lesson designing levels for Quake? 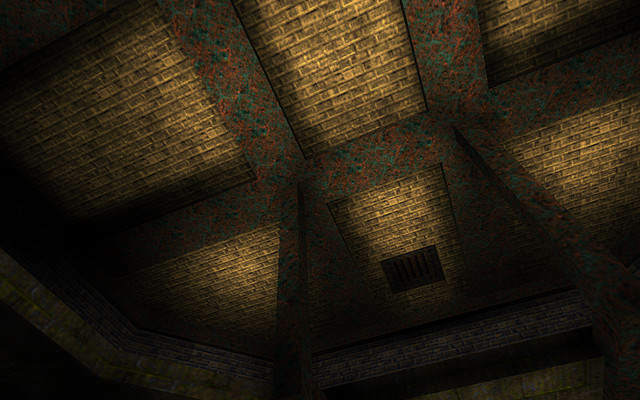 What is the aesthetic value of Quake? I have tried to show that Quake isn’t just a game, but more a set of technologies. I believe that with the right combination of architecture, lighting, environmental and player interaction, a simple game of Quake can become a complete experience, a form of art. It may not have happened yet. It may not happen. But to me, Quake is the first place that all the correct elements have come together to form a totally new way of communicating, playing and experiencing art with other human beings. It is not hard for me to imagine drama, tragedy, political satire or social commentary in a game of Quake. That is the aesthetic value of the Quake technology – that it opens possibilities where previously there were none. It is the first step beyond the computer game and into the world of the network game.